This is how crazy the situation has become in Ireland. The abortion bill that is nearing a vote on the Emerald Isle is being pushed by politicians who promised not to do what they are now doing. OK, maybe this is not shocking anymore. But the bill is being sold as necessary to save the lives of pregnant women who are suicidal, even though so far none of the psychiatrists called to testify at the Irish hearings can say under oath that abortion was needed to save the life of a suicidal woman. Plus, many studies have shown that women who have had abortions are much more likely to commit suicide than women who have not had them. Overall, women with an abortion history experience an 81% increased risk for mental health problems. The results showed that the level of increased risk associated with abortion varies from 34% to 230% depending on the nature of the outcome. Separate effects were calculated based on the type of mental health outcome with the results revealing the following: the increased risk for anxiety disorders was 34%; for depression it was 37%; for alcohol use/abuse it was 110%, for marijuana use/abuse it was 220%, and for suicide behaviors it was 155%. So the proposed bill, called the Protection of Life during Pregnancy Bill, isn’t actually designed to protect a single life during pregnancy. It is designed to destroy life. As some Irish politicians who support the bill have admitted, it is only intended as the opening to abortion on demand. This is obvious, of course, but still it helps when pro-abortion pols admit it. It is possible that all a woman will have to do if this bill becomes law is claim – after being coached by counselors or nursing staff on what to say — that she is considering suicide, and she can therefore bypass all restrictions on abortion, at any point in her pregnancy. All this, supposedly to protect the lives of pregnant women, in a nation whose maternal mortality rates are among the very lowest – that is, the best – in the world. It is tempting, and perhaps not even unfair, to ask, ‘What is happening to Ireland?’ But it’s hard to throw that rock from the glass house of America. The same thing is happening in Ireland that has long been happening here — we have ceded control of our nations to radicals who could genuinely care less about what the majority of the nation’s citizens think. These people think that abortion, despite truckloads of evidence to the contrary, is a boon for women’s health, and that it is a human right. I always want to sit these people down and ask them a question: Can you name another supposed “human right” that, 40 years after it had been won, was actually opposed by many thousands of people who had exercised that right? Can you name just one such “right?” How many freed slaves dedicated their lives to reinstate slavery? How many women who won the right to vote in the United States in 1920 turned around after a couple decades and said that they should never have been allowed to vote? The fact is that there is no such thing as a right to abortion. That the pro-life movement is now led by many women who have had abortions, and who will make any sacrifice to stop other women from making the same mistake, is a testimony to this fact. 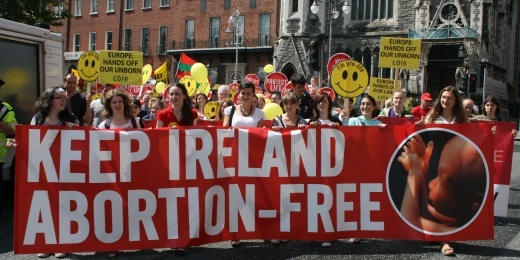 Ireland has avoided the legalization of abortion for decades while maintaining its reputation as one of the safest places in the world to give birth, but that has not stopped British, European and American billionaires from pouring money into Irish “human rights” groups to reverse this law. And now they are very close to achieving their goal. If I sound angry that’s because I am angry. I am just returning from Mexico City, where I met with other pro-life leaders, clergy and seminarians. Six years ago this city suffered a similar onslaught of foreign interference, legalizing abortion over the objections of the majority of the citizens of the Federal District of Mexico. Almost immediately movements sprung up in other Mexican states to revise their constitutions to prevent this from happening, and most of these succeeded. As we have seen in other nations where abortion is legalized under false pretenses, what follows is not greater peace and prosperity, but more pitched political battles and corruption. And, more and more, we see governments willing to crush other basic rights to preserve the false rights that have been adopted. We see the rights to free speech and freedom of religion trampled so that our overlords and their allies do not have to hear a voice of dissent, and we see the fundamental institutions of family, Church and citizens groups attacked so that there will be no resistance. This isn’t peace and justice that is being promoted, and it is not progress. It is war and injustice, especially for those millions of children who suffer violent deaths, and for women who are sold a false way to supposed liberation, only to suffer terribly. Please pray for Ireland, for Mexico, and for your own nation. This is by no means over, and as we act, we must do so in accordance with the will of God, which requires our prayerful attention to his voice in our lives. Here in the United States we can today join with our bishops in this second Fortnight for Freedom. Let’s get the word out far and wide — we need prayer and the kind of action that is informed by prayer if we are going to turn this around. I had a friend in college who got an abortion in D.C. before Roe v Wade. She wasn’t just coached by her parents to say she’d commit suicide, she was bullied into it. She had wanted the baby, had already give it a name, bought maternity clothes and checked into arrangements about a home to stay in until the baby was born. She knew she was lying, but she also knew her parents would pull any further support for her college expenses if she didn’t go through with it.